Specifically recognizes mammalian GFAP on western blots and immunocytochemically. Detects a band of 55kDa corresponding to GFAP and also a GFAP derived 48kDa band. Some customers have successfully used ab7260 on Zebrafish lysates; however we have conflicting data to suggest that not all batches will be suitable for work on Zebrafish. For further information, please contact Abcam Scientific Support. Recombinant full length protein corresponding to Human GFAP. Isotype 1 expressed in and purified from E. coli. 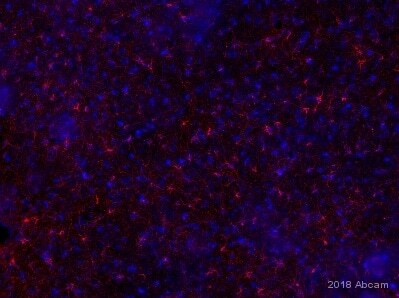 IHC-P: FFPE mouse brain normal; FFPE rat brain normal. WB: Rat and mouse brain and spinal cord lysates. In some cases, the antibody may appear red in color. This is due to small amounts of hemolysis, and does not affect antibody performance. Our Abpromise guarantee covers the use of ab7260 in the following tested applications. WB 1/10000. Detects a band of approximately 55,48 kDa. This lower 48kDa band is thought to be a degradation product. IHC-P 1/1000 - 1/2000. Perform heat mediated antigen retrieval with citrate buffer pH 6 before commencing with IHC staining protocol. Photomicrographs show immunoreactivity for GFAP or ALDH1L1 in (A) the corpus callosum, or (B) the dorsal column white matter of adult mice at base line, and at 14 d after microinjection of the demyelinating agent lysolecithin. Histograms show the percent area of GFAP immunofluorescence, and expression of GFAP/ALDH1L1+ astrocyte, was significantly greater in the spinal cord compared to the corpus callosum 14d post-lysolecithin lesion. GFAP was detected using ab7260. Images showing GFAP+ cells (magenta), Ki67+ cells (red), terminal deoxynucleotidyl transferase-mediated dUTP nick end-labelling (TUNEL)+ cells (green), and DAPI staining (grey) within the 4 subdomains. Separate colour channels are given in S1E Fig. Apoptosis is only observed in the dorsolateral and ventral subdomains. GFAP is detected in frozen sections of mouse brain using ab7260 at 1/500 dilution. Immunohistochemistical detection of GFAP antibody - Astrocyte Marker (ab7260) on formaldehyde-fixed paraffin-embedded monkey brain sections. Antigen retrieval step: Heat mediated. Buffer Used: Citric acid pH6. Permeabilization: None. Blocking step: 1% BSA for 10 mins @ 21°C. Primary antibody incubated at 1/2000 for 2 hours @ 21°C in TBS/BSA/azide. Secondary antibody: anti rabbit IgG Conjugated to biotin (1/200). Marmoset brain: astrocytes are clearly and strongly labeled. Immunocytochemistry/Immunofluorescence of mixed neuron-glial cultures labelling rabbit GFAP (red channel) and chicken vimentin CPCA-Vim (green channel). The fibroblastic cells contain only vimentin and so are green, while astrocytes contain either vimentin and GFAP, so appearing golden, or predominantly GFAP, in which case they appear red. Blue is nuclear DNA stain. 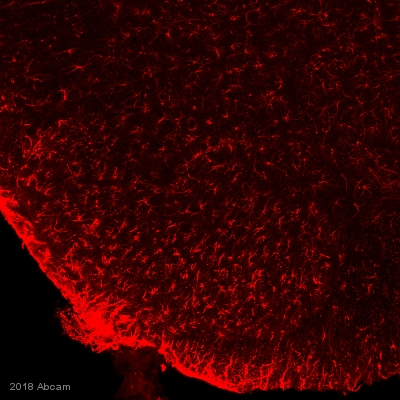 IHC image of GFAP staining in a formalin fixed, paraffin embedded normal mouse brain tissue section, performed on a Leica Bond™ system using the standard protocol B. The section was pre-treated using heat mediated antigen retrieval with sodium citrate buffer (pH 6, epitope retrieval solution 1) for 20 mins. The section was then incubated with ab7260 at 1/2000 dilution for 15 mins at room temperature. A goat anti-rabbit biotinylated secondary antibody was used to detect the primary, and visualized using an HRP conjugated ABC system. DAB was used as the chromogen. The section was then counterstained with hematoxylin and mounted with DPX. ab7260 at a 1/5000 dilution staining rat spinal cord tissue sections by IHC-Fr. Rats were transcardially perfused with 4% PFA. The tissue was post fixed 1 hour in 4% PFA and then 30% sucrose for three days. 20µm sections were cryostat cut. The primary antibody was incubated with the tissue sections for 18 hours. Bound antibody was detected using an Alexa Fluor ® 488 conjugated goat anti-rabbit polyclonal. IHC - Wholemount of rat retina tissue labeling GFAP (red) with ab7260. Sample was incubated with primary antibody (1/100) for 18 hours at 4°C. A Phycoerythrin-conjugated goat anti-rabbit IgG monoclonal (1/1000) was used as the secondary antibody. 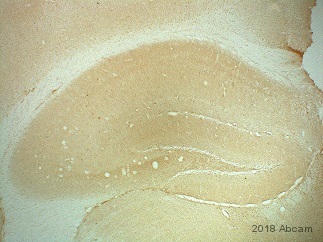 IHC image of GFAP staining in a formalin fixed, paraffin embedded normal rat brain tissue section, performed on a Leica Bond™ system using the standard protocol F.
The section was pre-treated using heat mediated antigen retrieval with sodium citrate buffer (pH 6, epitope retrieval solution 1) for 20 mins. The section was then incubated with ab7260 at 1/2000 dilution for 15 mins at room temperature and detected using an HRP conjugated compact polymer system. DAB was used as the chromogen. The section was then counterstained with hematoxylin and mounted with DPX. Immunocytochemistry/ Immunofluorescence - Anti-GFAP antibody (ab7260)This image is courtesy of an Abreview submitted by Chia-Li Lin. ab7260 staining GFAP in cells from mouse brain tissue sections by ICC/IF (Immunocytochemistry/immunofluorescence). Cells were fixed with paraformaldehyde, permeabilized with 0.1% Tween 20 in PBS and blocked with 1% BSA for 40 minutes at 25°C. Samples were incubated with primary antibody (1/1200 in TBS) for 24 hours at 4°C. Goat Anti-Rabbit IgG H&L (DyLight® 488) (ab96883) was used as the secondary antibody at a dilution of 1/200. 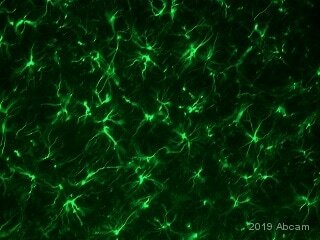 ab7260 at 1/10000 dilution staining mouse cortical astrocytes by Immunocytochemistry. The cells were permeabilized with Triton/HEPES buffer prior to primary application. The antibody was incubated with the cells for 18 hours and then bound antibody was detected with an Alexa Fluor ® 488 conjugated goat anti-rabbit antibody. This image is courtesy of an Abreview submited by Charmaine Noonan. 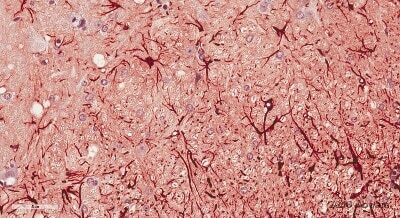 ab7260 staining rat brain tissue sections by IHC-P. Sections were fixed in formaldehyde and blocked with a commercialy available blocking agent prior to incubating with ab7260, diluted 1/5000 for 20 hours at 4°C. An HRP conjugated mouse polyclonal (universal HRP polymer detection) antibody was used as the secondary. 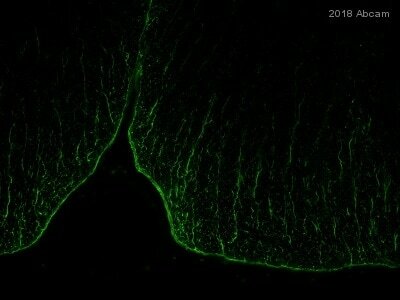 Western blot of whole rat cerebellum homogenate stained with ab7260 at dilution of 1:100,000. A prominent band running with an apparent SDS-PAGE molecular weight of ~55kDa corresponds to rodent GFAP. A lower band at ~48kDa is derived from the GFAP molecule. Immunohistochemistry (Formalin/PFA-fixed paraffin-embedded sections) - Anti-GFAP antibody (ab7260)Image is courtesy of an anonymous AbReview. Immunohistochemical analysis of formaldehyde-fixed paraffin-embedded canine neuronal tissue sections, labelling GFAP with ab7260 at a dilution of 1/1000 incubated for 90 minutes at 25°C. Antigen retrival was with 10mM citrate pH6.0 (heat mediated). Blocking was with 10% serum incubated for 30 minutes at 25°C. Secondary was a Goat anti-rabbit polyclonal Texas Red® conjugate at 1/200. ab7260 staining rat pup cortical preps by ICC/IF. The preps were grown for 14 days in culture and plated onto coverslips. The preps were acid/alcohol fixed and blocked prior to incubation with ab7260. 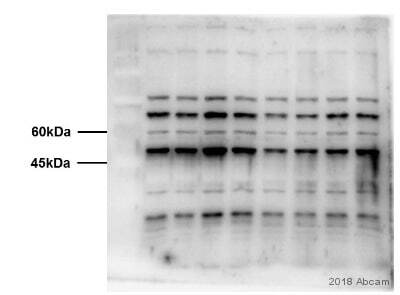 Bound antibody was detected using an Alexa Fluor ®488 conjugated goat polyclonal antibody. Nuclei were visualized using DAPI. ab7260 staining GFAP in mouse eye tissue sections by Immunohistochemistry (paraffin embedded sections). Tissue was fixed with paraformaldehyde and a heat mediated antigen retrieval step was performed using citrate buffer pH 6.0. Samples were then permeabilized using 0.5% Triton X-100 and blocked with 5% serum for 20 minutes at 25°C; followed by incubation with the primary antibody, at a 1/500 dilution, for 16 hours at 4°C. The secondary antibody used was a goat anti-rabbit IgG conjugated to Alexa Fluor® 488 used at a 1/5000 dilution. The retinal layers are: ganglion cells layer (GCL), inner plexiform layer (IPL), inner nuclear layer (INL), outer plexiform layer (OPL), outer nuclear layer (ONL), and photoreceptor outer segments (ROS). Nuclei were counterstained with DAPI. 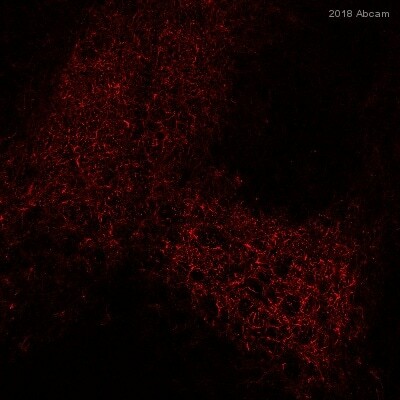 GFAP antibody ab7260 was used with Tissue Clearing Kit ab243298 to penetrate, stain and clear a 1 mm coronal section of mouse brain. Blue: DAPI, Green: GFAP. To use this antibody with tissue clearing, use Tissue Clearing Kit ab243298. For 1 mm brain sections, we recommend a starting dilution of 1:1000, and also using Goat Anti-Rabbit IgG H&L AlexaFluor488 (ab150077) at a dilution of 1:400. GFAP antibody ab7260 was used with 3D Cell Culture Clearing Kit ab243299 to penetrate, stain and clear a 3D neuronal spheroid cell culture. Blue: DAPI, Green: GFAP. Learn more about 3D cell culture clearing and tissue clearing kits, reagents, and protocols designed to make it easier to stain 3D cell cultures and thick tissue sections and get more data from each valuable tissue section. 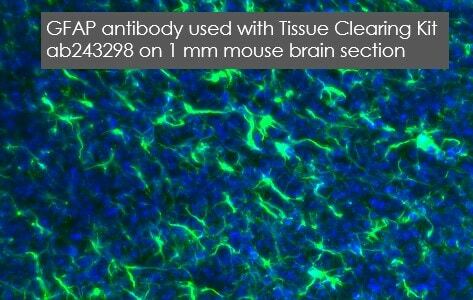 To use this antibody with clearing, use our 3D Cell Culture Clearing Kit ab243299. We recommend a starting dilution of 1:1000, and also using Goat Anti-Rabbit IgG H&L AlexaFluor488 (ab150077) at a dilution of 1:400.